The Irish Colleges Match Play semi-final line-up has been set for tomorrow after a hard-fought day in the wind at Woodbrook Golf Club. Of the four Maynooth teams that teed up in the last eight, just one survived to give a national flavour to tomorrow’s proceedings. In the first match, Maynooth Club (a) narrowly defeated Maynooth Scholars (a) 2-1 with Darragh Flynn’s 3&2 win over Ronan Mullarney of particular note. In the top match, MU Club’s Sean Clancy and Luke Harris’ 2UP win set the tone for the battle with Conor Ryan’s 7&6 mauling in the last match only providing consolation for the scholars. In match 2, it proved a clean sweep for Belfast’s Queens University with Paddy Cunanne and Vincent Cooney getting the better of Ellie Metcalfe and Molly Dowling on the 22nd hole in a thriller, while David Burns and Mark McKinstry also claimed narrow wins for a 3-0 overall victory. In the penultimate encounter, Cork IT overcame a poor start to take their place in the last-four after a 2-1 win. Gary Ward returned parity to the match before Cork’s Sean Leonard’s 4&3 triumph ensured the rebels advanced to tomorrow’s semi-final. 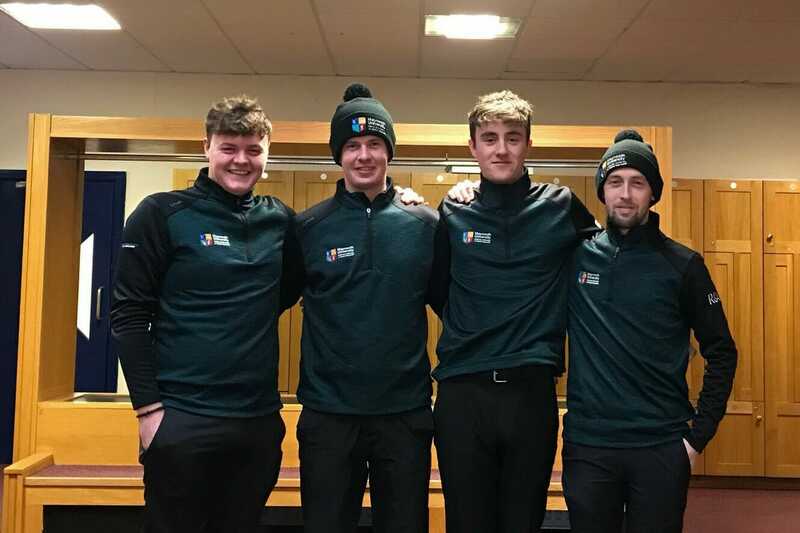 While in the final act, Ulster University proved imperious, romping home 3-0 with big wins for Philip Johnson and Mark Kilpatrick’s fourball, with James McVicker and Ross Dutton also cruising home in their individual matches.